I used to commute to Brussels by train. The usual experience: full compartments, sometimes people had to stand if they didn’t want to wait for the next train. When I went to a conference about the financial crisis (slides) last month, the train was almost empty. As recently as five years ago, few companies allowed telecommuting. If your supervisor was OK with it, you were lucky to work from home once a week. Nowadays, almost everybody realizes that a lot of jobs don’t need the physical presence of workers in some central office. With just a laptop, a VPN, and a headset you’re ready to collaborate with your colleagues from the kitchen table. Credit where credit is due: banks were among the first to institutionalize telework. Author JanMusschootPosted on October 8, 2018 October 8, 2018 Categories EnglishTags investingLeave a comment on Show me the money, nerd! 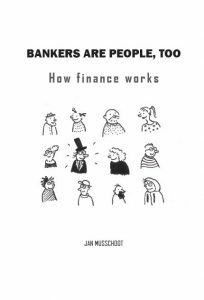 My book Bankers are people, too was published on this day one year ago. A big ‘thank you!’ to all readers and supporters!